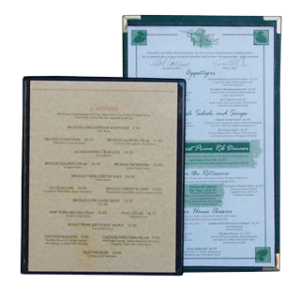 Restaurant menu covers are available in 11×17 and custom sizes. Custom Menu Covers Specially Designed for your Restaurant Available. 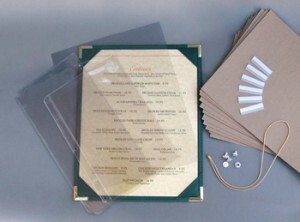 Cafe style menu covers with clear panels, sewn with leatherette or nylon fabric binding and metal corners. A selection of casual style menu covers with clear pockets, ideal for family restaurants, bars, sports bars and bistros. Large selection of faux leather materials, football & basket ball. 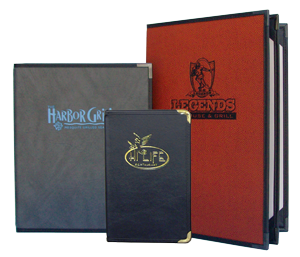 For more upscale casual dining a collection of rigid menu covers with corner tabs to hold menus in place. Large selection of imitation leather materials, football and basket ball. 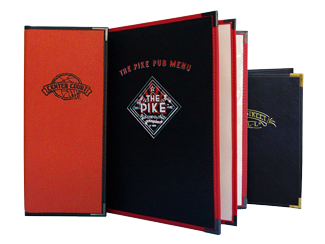 A large selection of case bound restaurant menu covers with choice of corner tabs or top and bottom bars to hold menus. Cork, leather, faux wood, imitation leather, basket weave and more. Covers and Books for wine menus, options include screw post, 3 ring, corner catch on clear panels, large selection of materials. 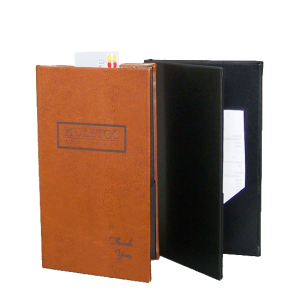 A selection of case made menu covers in faux leather with edges turned for an elegant look, in stock and quick ship covers with custom decoration. 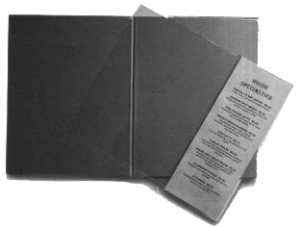 Single panel rigid menu covers with Corner Tabs on both sides. Holds 2 menu pages, one on each side of Menu Board. Hard menu covers that are single panel with clear plastic pockets on both sides of the board. Holds 2 menu inserts. 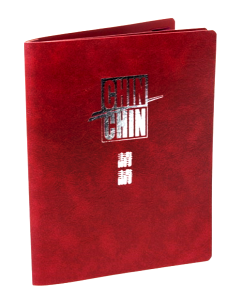 Thin leatherette menu covers available with diagonal corner catches or folded style for use with elastic tassels. In room hospitality supplies; Hotel Guest Directories, Breakfast door hangers, tray removal cards, water conservation and specialty hangers. Large selection of standard and custom guest check holders.Options include credit card pockets, diagonal pockets and pen loops. A-Frame, 3 and 4 sided table tents in imitation leather, cork and faux wood. 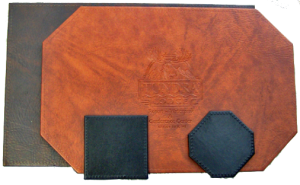 Ultra fine dining rectangular and Octagonal imitation leather placemats with matching coasters, large selection of materials. 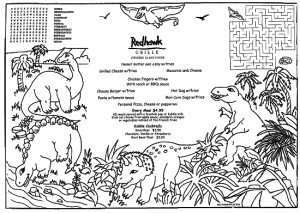 Children’s Menu Placemats in black and white for coloring with activities and customized with your restaurant kid’s menu. 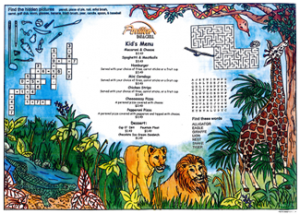 Children’s Menus in color with activities to entertain young guests and customized with your restaurant kids menu. 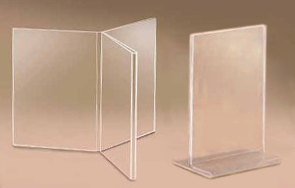 Table top display configurations include; upright, 3-wing, 4 view and easel. Large selection of sizes. Add an extra page or partial page to your menu covers with clear pockets. 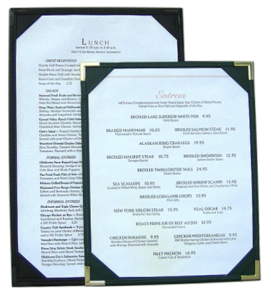 Restaurant Menu Covers are available in standard or custom sizes, with clear plastic pockets or corner tabs to hold your menus all at competitive prices. 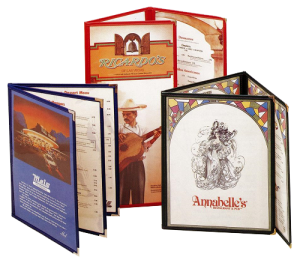 MenusPlus offers the largest selection of cover materials, menu cover lining and options available including hard to find 11×17 menu covers for restaurants and free custom design service. MenusPlus offers a large selection of quality Restaurant Menu Covers, Hotel and Restaurant Menu Supplies and accessories including Wine List Covers, Menu Holders and Menu Boards, Drink Menu holders, Dessert Menu Covers, Check Presenters, Bar Menu Jackets, Hotel Door Hangers, Guest Directories and children’s menus all made in the USA. 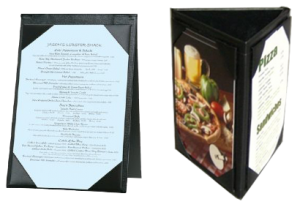 We offer a large selection of case bound or case made Menu Covers for Fine Dining restaurants as well as flexible menu holders and rigid menu covers with clear plastic pockets or corner catches for more casual dining, Bistros and Bars. Our in-house manufacturing and design allows us to help you with the perfect menu cover for your restaurant. 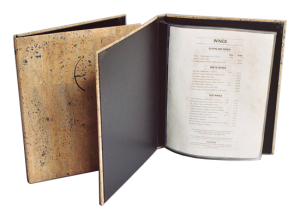 MenusPlus offers a wide variety of standard and custom menu cover styles to suit your needs and décor of your restaurant. Looking for creative ideas for your restaurant menu covers, we can help! Present your fabulous restaurant menu to your patrons with stylish menu holders from MenusPlus. We can help you create your own custom menu covers. In business for over 20 years and backed by more than 30 years of experience providing the restaurant and hospitality industries with quality menu covers, throughout the US, Canada and the Caribbean. 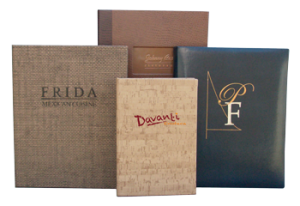 We are proud to provide top-quality Restaurant Menu Covers, hotel and restaurant supplies made in the USA. 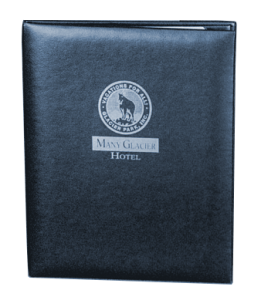 From menu covers for restaurants, wine list menu covers, wine menu books and children’s menus, to hotel breakfast door hangers, water conservation, in-room dining and promotion, Guest Services Directories or tray pick up cards we have what you need. With our dedication to quality products and customer service, MenusPlus is the name to trust for quality restaurant and hotel supplies. Have us create your unique custom menu covers for your restaurant. Whether you’re looking for fine dining menu covers, casual menu jackets, Café style covers, or a menu holder to meet a particular need, we can help. By providing clear and concise methods for presenting a restaurant menu, we have provided solutions to many of the premier restaurants in the hospitality industry, and we look forward to helping you. Contact us for additional information or to purchase quality specialized restaurant supplies, including restaurant menu covers, hotel breakfast door hangers and printed children’s menus.